When I can find persimmons in the market, I serve this persimmon dessert at my restaurant Canary By Gorji—a ripe persimmon filled with berry sorbet. I’m still seeing some persimmons in the markets. They bring a lot of childhood memories back to me. 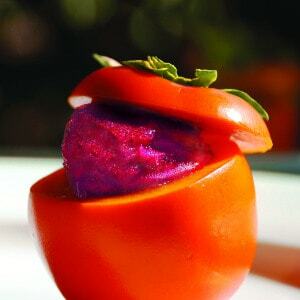 We had a few persimmon and other fruit trees in the backyard when I was growing up. Us kids were always climbing and competing for the ripest to pick and enjoy while still up there, hence putting the monkeys to shame. In this savory dessert I serve at my restaurant, Canary By Gorji, I used the beautiful ripe fruit, without cooking it and filled it with berry sorbet, but there are many ways to use them. You can bake, poach, pickle and make jams with them. Even though this one in the photo was almost perfect, a lot of times they will have spots and imperfections. Don’t let that stop you from using them, because often those are the ripest and sweetest! Go find the ripe persimmons and use them while they last this year and let me know how you used them. No Replies to "Persimmon Dessert & Childhood Memories"